The student fossil fuels divestment movement is making good use of the calendar's only built in day of protest. In activist circles, it’s common to refer to major protests by their dates. The anti-war movement has Feb. 15 (which refers to the global protests against the invasion of Iraq in 2003). More recently, the indignados of Spain went so far as to call their movement 15-M (a reference to May 15, 2011 — the day their anti-austerity protests began). And just earlier this month, some were calling the Forward on Climate rally in Washington, D.C. F-17. None of these dates are particularly meaningful to anyone outside the movement — a point I was discussing with several longtime activists while marching on, well, F-17. I believe it was John Sellers, co-founder of The Other 98%, who then pointed out that there are actually some dates worth using. For instance, March 4. It’s not just a date, it’s also a command: March forth! I couldn’t believe I’d never thought of this before or seen it used. Of course, a quick Google search shows that many have taken advantage of this calendrical pun in recent years — from public education workers in California to immigration justice activists in Cincinnati. But still, far more could be done to exploit this built-in call for action that comes every year on this date. While much of the organizing seems to be coming together last minute (via a Facebook page and a Google group), hundreds have signed up to participate. Students at Syracuse University and SUNY College of Environmental Science and Forestry are holding a rally while representatives meet with administration officials about divestment. Meanwhile, students at Yale are gathering for a photo and video op, which will be compiled into a larger nationwide divestment video that 350.org is helping produce. 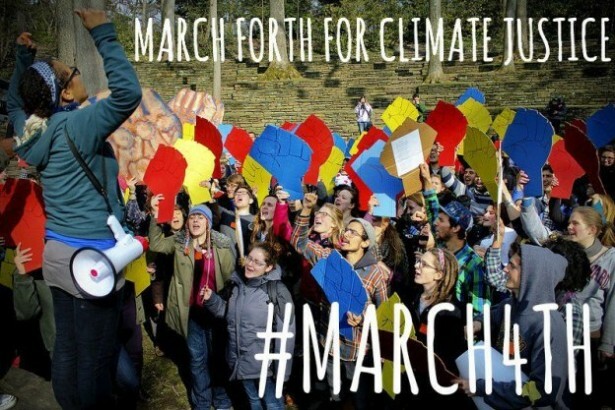 Despite the hurried nature, it will be interesting to see if this burgeoning fossil fuels divestment movement can make waves with a creatively titled action like March Forth on Climate Justice. If not, there’s another chance for calendar fun coming up soon: May 4, as in May the fourth be with you. Can’t you just see climate protesters doing battle with the Death Star that is the fossil fuel industry?